Long-time Best Beer HQ readers should know by now that I’m a sucker for a beer that features a lot of citrus in it, so it’ll come as no surprise that upon a visit to the iconic Jackson Brewery bar in New Orleans (620 Decatur Street) Urban South Holy Roller Grapefruit IPA was the first of three craft brews I tried. 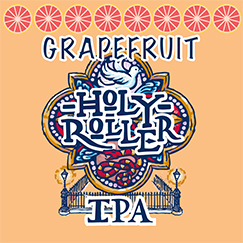 Blurb about the beer: A taproom favourite, we infuse our popular Holy Roller IPA – which is brewed with Centennial, Cascade, Mosaic, and Citra Hops – with natural grapefruit extract. Urban South: A brewery and taproom in the heart of New Orleans, Louisiana. According to the website, Urban South is all about combining the heritage of European beer making with the brashness of new American styles. Taste test: There’s no mistaking this for anything other than an IPA with added grapefruit. It positively smacks of the citrus fruit, which is no bad thing for me, but others might be put off by its considerable sweetly-sour-bitter intensity. It pours a hazy gold colour, with about a two-finger fluffy white head. It goes down smooth – again, provided you like grapefruit – with a bitter finish. It’d have a very bitter finish indeed, if you don’t enjoy large amounts of added citrus in your beer. The verdict: When life give you grapefruits, you should make a delicious citrus IPA from them. Beer/movie combination: I haven’t seen this film since 2009 when it was out in cinemas, but I remember thoroughly enjoying girl-power dramedy Whip It, starring Ellen Page as a small-town roller derby star. I also seem to remember there being a team in the movie called the “Holy Rollers”, hence my recommendation.